Death. It’s coming for someone on Supernatural, and it might just be permanent. Though, even with Sam getting shot and seemingly killed and then Dean actually trying to kill himself before getting revived on Supernatural Season 11 Episode 17, it’s hard to actually believe that either will be heading off to the empty to never return. Plus, we all know that there is going to be a Supernatural Season 12, so even if Sam and Dean managed to die in, say, the Supernatural Season 11 finale, we all know they’d just come back again. It’s rather routine at this point. That just makes me think that the only other option that would be up for Billie the reaper’s “no more lives” would be either Castiel or Crowley. Unless there’s something I’m overlooking and/or the writers are going to pull a crazy and jaw-dropping stunt that could change everything. But really, “Red Meat” had me thinking more about what’s in store for these last episodes of Supernatural Season 11 and less about the actual episode. Because while things kicked off in a rather intense fashion with that werewolf fight and Sam getting shot, which was a great beginning, it went rather downhill from there. First, the jumping back in time to fill in a few blanks was unnecessary. Did it really add much to see them choose to go on the case and then get the clues to go to the cabin? I definitely didn’t care about that one rescued hiker, and that was even before he tried to kill off Sam. But the longer we hung out with his character, the more annoying I found him. He definitely wasn’t a threat, and I was just waiting for someone to take him out. That only took the entire episode. 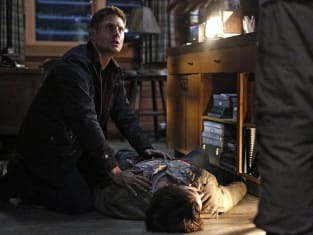 I give Dean credit for choosing to help the rescued hikers even after thinking his brother was dead. He totally could have stayed and waited for the other werewolves, but I liked that he helped get the hikers to safety. At the same time, it was actually refreshing to see Sam injured. Not that I’d want his character killed off in a monster of the week episode by any means, but it’s good to see Sam and Dean get roughed up sometimes and not just come out unscathed. Granted, this was pretty extreme, but it was easy to feel Sam’s pain and injury as he tried to move about. Plus, it was great to see him push through it all, bleeding out, and manage to kill a few more werewolves and show up just in time to save his brother. But the werewolf story really wasn’t that interesting, and really seemed to be there to both foreshadow something coming up for Sam and Dean and give Dean an opportunity to talk to Billie. And that meet up was such a waste. I actually really like Billie, but what was the point of her appearing in this episode? All she did was tell Dean Sam was still alive and that there are no more second chances… and then Dean got a chance to come back to life. I get that Dean is willing to do whatever it takes to save his brother, and we’ve seen him and Sam do it over and over. The brothers are persistent when it comes to that. But I guess I was expecting more from his conversation with Billie. On top of that, the way the episode ended was just weird. Why did Dean not tell Sam about his actions after thinking Sam was dead. It felt like such a step back. Sure, Sam probably would have been mad, but it would have been out in the open, and it’s been so great to have Sam and Dean generally be open with each other this season. After such a fantastic case of the week on Supernatural Season 11 Episode 16, I was let down by Supernatural Season 11 Episode 17. I’m still hopeful about what’s in store as we head back toward the larger story, but this was a lackluster detour. What did you think? Are you worried about Sam and Dean dying? Will Billie play a larger role in an upcoming episode? Sound off below, and be sure to watch Supernatural online! NOTE: Supernatural Season 11 Episode 18, "Hell's Angel," airs April 6 at 9/8c. I told you that roadhouse chili was a bad idea. Permalink: I told you that roadhouse chili was a bad idea. Game’s over, Dean. No more second chances. No more extra lives. Time to say bye bye to Luigi, Mario. 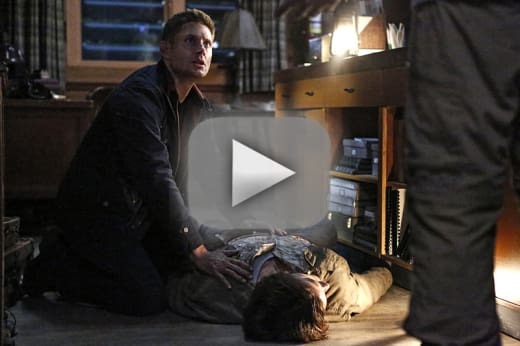 Supernatural Round Table: Fear the Reaper?